The Malden Muse is Malden’s first Arts & Cultural online Newsletter devoted to the artistic and cultural benefit of Malden. 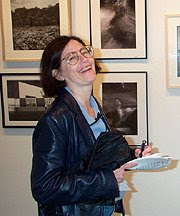 I have known Roanna Forman, editor and founder of the Malden Muse, since its inception in May 2005. My enormous respect for Roanna arose from her commitment to creative writing and the arts community. The Malden Muse, Roanna's online arts journal filled a timely need in the art community. Not only it informed Malden and its environs of art events and cultural activities, it also helped area artists network among themselves. Furthermore, it included a section on “cultural diversity,” which is so much a part of the defining strength of Malden community. There were also sections for poetry and short fiction. Roanna has created a vehicle for Malden citizens and artists alike to strengthen their connections and made Malden a culturally richer place. To read more about Roanna's thoughts on starting the Malden Muse, please visit MaldenMuse's archives > May 2005 Introductory Edition. The Malden Muse site, www.maldenmuse.com, will say goodbye on January 17. The Muse covered arts and cultural events in the Malden area. We’ve enjoyed publishing, and wish to thank all who contributed – writers, artists, volunteers, supporters, the City of Malden, and the Malden Cultural Council. We especially thank Sand T, the main inspiration and strongest supporter of the Muse. Thanks to all our readers, for supporting the arts in Malden and beyond. My want to express my utmost gratitude to Roanna for all of the hard work and creativity in running the Malden Muse. I am always grateful for having the opportunities to share my thoughts with her. Many congratulations to you, Roanna, I wish you all the best in your new endeavors and look forward to reading more your creative writings. Currently, Roanna Forman writes about the Boston jazz scene for jazz.com, is one of the most astute critics on the scene. Visit http://www.jazz.com/search?q=Roanna%20Forman to read more of her writings.